Draw a star shape on the plastic side of some clear contact. 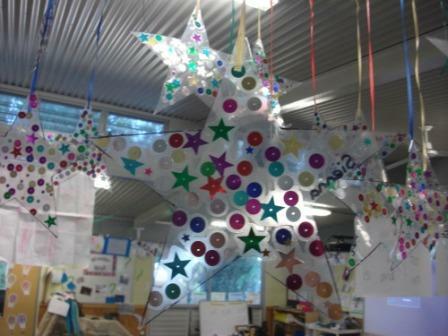 Peel off the paper and encourage the children to use their index finger to pick up sequins and place them on the sticky side of the contact , staying inside the star shape. When they are satisfied with their sequin collage, place another piece of contact over the top and press them together. Older children can cut out the star themselves but younger children may need some help. Punch a hole in the star and hang from some ribbon. Now that the weather is cooler I have hung some tulle from the ceiling fan and suspended the stars from this. A very easy and decorative activity and if you turn the fan on slow the stars rotate slowly. Much to the children delight. Glitter sprinkled aroung the sequins prior to covering with the top piece of contact adds extra sparkle. 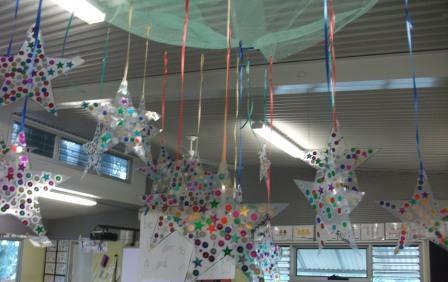 Stars hanging from the tulle over the ceiling. A closer look at a star. Once upon a time some children built a castle and found a dragon! cute, great fine motor practice picking up those sequence. These are so adorable! My daycare kids would love them.